If you’re an Airbnb host with a luxury property suitable for group events, you probably attract guests who want to use your place for special occasions like their wedding or milestone birthdays. Being able to provide them with a high quality party tent can help you attract more guests and earn higher approval ratings. Advertise your property:The best kind of advertising helps people to picture themselves enjoying your property for whatever activities they have in mind. With a party tent, you’ll be able to take photos that show what a great spot you have for entertaining. Your guests may even share their personal party photos with you if they have a great experience. Protect your property:Even the most responsible guests can have accidents, so it’s advantageous for you if they want to do their entertaining outside where they’re less likely to break your vases or stain anything. After all, it’s a lot less hassle if red wine spills on your lawn instead of your carpet. Make your guests happy:Your guests will appreciate the convenience of having a party tent available, especially if they’re planning an event in a city where they don’t know many people or local businesses. It’s one less arrangement they have to make or worry about. It’s also convenient for you because it’s the kind of amenity that doesn’t require any extra labor on your part. Instead of having to play tour guide, you can stay home chilling and watching Netflix while they enjoy the tent. Canopiesandtarps.com offers party tents and other products in a wide variety of sizes and colors so you’re guaranteed to find something that will delight your guests and look fabulous with your property.Contact ustoday to start shopping for products that can help make you a more successful Airbnb host. This entry was posted in party tents and tagged party canopies, party tents on February 11, 2019 by Canopies Tarps. This winter, why not set up a party tent and host a holiday event outside? 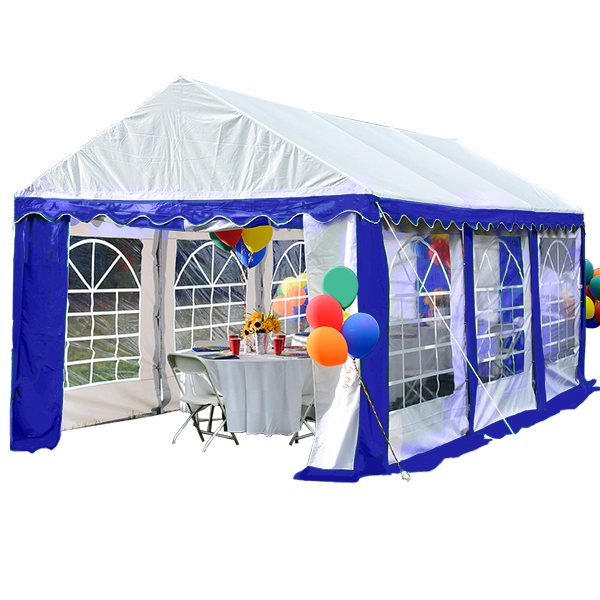 Todays party tents are perfectly suited for winter use because they come with side walls and may be outfitted with portable heaters. So theres nothing stopping you from creating a winter wonderland large enough to accommodate a great number of guests. 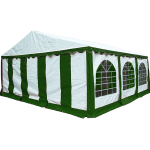 One of the most popular models is our 10 x 20 1.5 green and white party tent. Right now, its heavily discounted and available to be shipped across the Continental United States. Plus, its a cinch to set up the structure outdoors, even if the ground is already a bit frozen. So youll easily beat the high banquet rental fees and have a great, festive place to gather in no time. 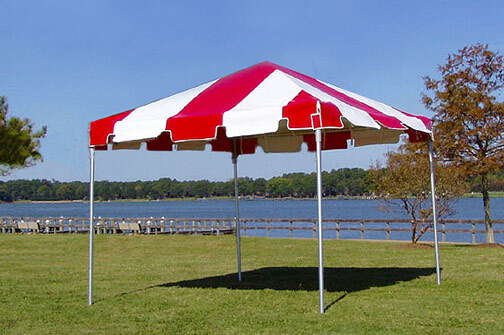 Our longtime customers also tend to rave about the party tents dark, green trim too. Its reminiscent of winters best evergreens. As such, it would look beautiful against white red LED lights, brown pine cones or gorgeous, red poinsettias. And did we mention the party tent typically comes with 8 support poles? The poles rim the party tents exterior and are strong enough to hold those lights and decorative elements weve mentioned. The poles smart spacing also makes the tents interior roomy enough to hold round, square or rectangular tables and chairs. And if you dont have them yet either, we can send you some. Theyre part of our party tent product line. We sell combination packages capable of seating 40 guests. In addition, customers may buy additional, folding tables to accommodate average size, buffet pans or the wait staffs serving lines. 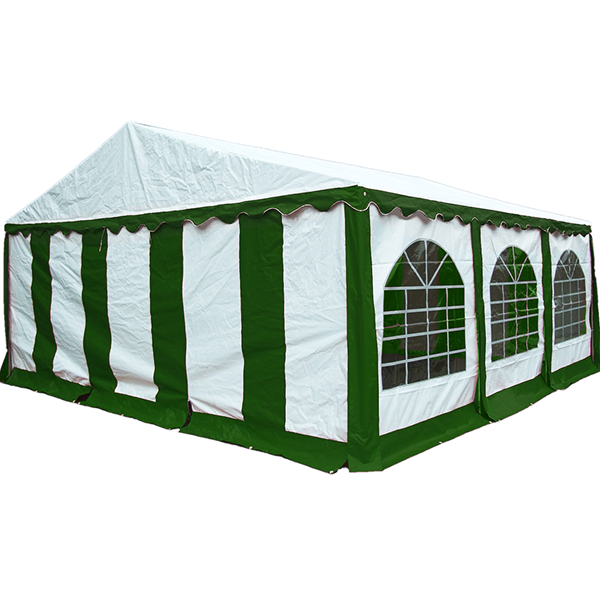 To learn more about them, our green and white model or other party tents for sale, please contact us online now. Well help you select one for winter and ship it to you quickly, without fail. This entry was posted in party tents and tagged party tents on December 29, 2016 by Canopies Tarps. It’s wedding season. Holding your ceremony or reception outside opens all kinds of amazing possibilities. Whether you choose to have your wedding in a mountain meadow, or at the lake where you spent every childhood summer, the setting will have special meaning. There is, however, a risk associated with having an outdoor wedding: the weather. When planning your wedding, you can control a lot of factors, but you can’t control the weather. What you can do is take precautions. If you are planning an outdoor wedding, party tents and canopies offer peace of mind. Consider shelter as part of your early planning process. If your venue has no indoor option, you should plan on using a tent in the beginning, when you make your venue decision, and simply factor it into your budget. Even if you do have an indoor option, you may want to consider minimal shelter. Imagine your ceremony is in a pretty forest glade, but a few drops of rain fall. Perhaps you need a canopy to cover the ceremony (which is a lovely option, regardless of the weather), or to protect your ceremony musicians and their delicate instruments. A small, inexpensive canopy will serve the purpose. You can even use a small tent or canopy to camouflage portable toilets. 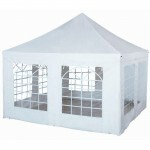 Party tents come in a variety of sizes, so you will have plenty of room for your guests to relax in the shade. On a hot day, a tent is effectively cooled by a simple fan. 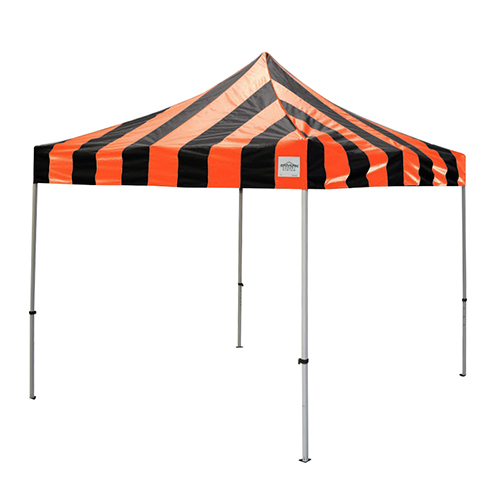 Tents are available in stripes or festive colors. You can have walls if you wish, and even windows, opening up the space to the beauty of the outdoors. Tents and canopies are simple to set up and fun to decorate to your taste. You can wrap the poles with ribbon or fabric for a gala look. You can also add a dance floor or a full floor. As for lighting, options are practically unlimited. You can do bistro lights, twinkle lights, theatrical type lighting, or put lights on a dimmer. Just remember to plan ahead so that electrical power is available. Don’t forget to check on local ordinances and comply with any permit requirements. When you are ready to discuss the different options available to you, be sure to work with an experienced company that offers great customer service. Whatever you choose, your canopy or tent will provide a setting for celebrations and gatherings for years to come. Best of all, you will celebrate your wedding in the setting you love, sheltered from the weather. This entry was posted in Party Canopies, party tents and tagged party tents on September 28, 2016 by Canopies Tarps. We know that the middle of winter isn’t the ideal time to begin your spring party planning, but winter is nearly half over. Spring is just around the corner. For this reason, we think that now is the time to start thinking spring, planning events, gardening, landscaping, and focusing your efforts on getting outside and beating the winter blues. In order to create a wonderful outdoor spring celebration, you could go the regular route with just a table in the open air, but why not try out a party tent instead? A party tent can turn any outdoor event into a new and brilliant occasion, no matter the situation. People who use party tents, as opposed to no tent at all, are generally more content to carry on with the merrymaking long past the usual time limit. 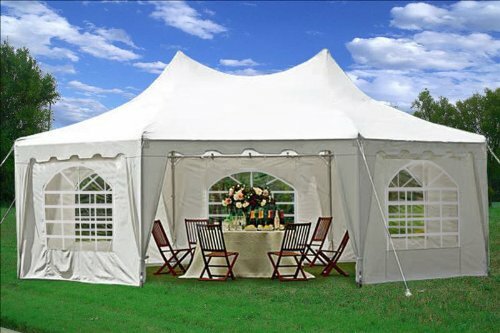 Plus, if your spring party is threatened by bad weather, your party tent keeps you protected from spring showers, even if they are great for the flowers, they aren’t so grand for party-goers. Then, when the party is over, you can either choose to leave the tent up until the next event or take it down and store it simply and easily. Party tents available today aren’t the same as older versions that people are used to. 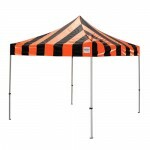 Party tents are also available in multiple sizes. 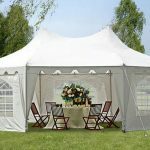 There are smaller tents for more private and subdued affairs and larger party tents for gatherings, graduations, and outdoor parties. 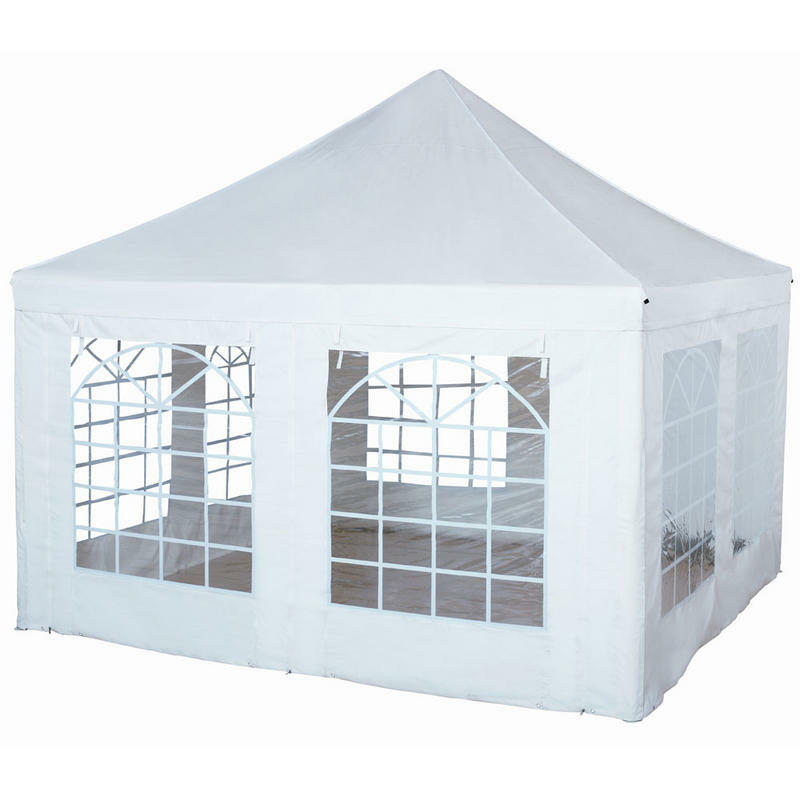 Simply search our catalog for the party tent that suits your needs best. If you’re ready to start planning your spring party celebration, please contact us today for more information. CanopiesAndTarps.com is a family owned and operated business with over 25 years experience in the manufacturing of tarps, tents, and canopies. This entry was posted in Party Canopies, party tent, party tents and tagged party tents on April 15, 2016 by Canopies Tarps. Are you getting ready to throw a party, and are you trying to make it turn out as good as possible? If so, then you will want to look into party tents. Tents give you plenty of room. Instead of trying to crowd everyone into your home or garage, use a tent and everyone will have room to get around and visit with one another. Use a tent and have the party at any location that you want. Throw the party at your home or at the park. Pick out the venue that you want, and then get the tent set up. You can decorate things in the way that you want. A tent is so simple that you will not feel the pressure to go with any certain theme. You also won’t feel discouraged by the clutter that is in your garage or home, and that will allow you to will feel excited about decorating. It is easier than hosting elsewhere. 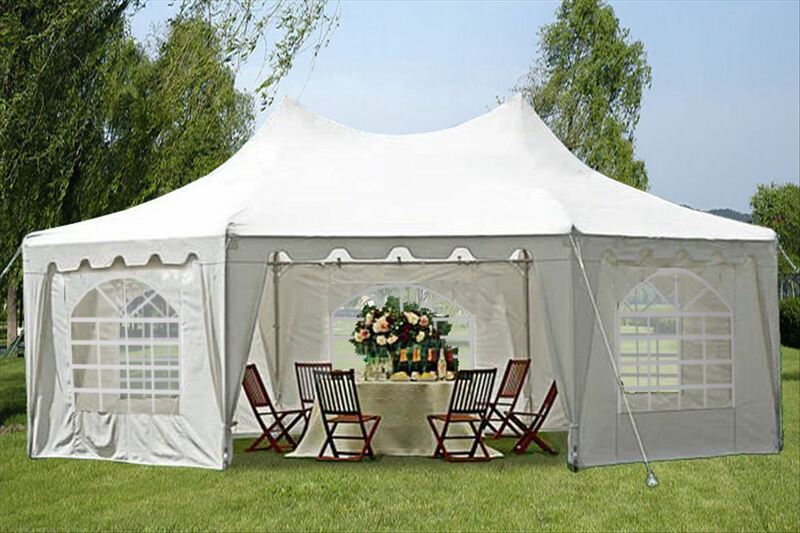 Host your party in a tent and things will go smoothly. Everyone will have a blast. Because you are less stressed in regard to the venue, you will feel happy during the party. Everyone else will enjoy the tent, as well, and the party will end up being a huge success. So, if you are planning a party and want to make it into something special, then you should contact us. We will get you set up with the party tent that you need. This entry was posted in party tent, party tents and tagged party tents on March 15, 2016 by Canopies Tarps. It is fun to throw an outdoor party, but when you are throwing one it is always a good idea to have some covered space, too. So when you want to throw a good outdoor party, consider using party tents. The tents will help keep everyone having a good time outdoors without getting too warm in the sunshine. You also won’t have to worry about the weather turning bad when you have tents set up, and that will leave you feeling relaxed. When you plan your party well and get tents set up your guests will have a great time. Everyone will enjoy themselves when they have a place to go to cool down, or to just hang out. Tents offer the opportunity for fun, as well, from dancing to eating, and party tents will help keep the party at its best. There are many reasons to love party tents, and the fact that all of your guests will have somewhere to go to hang out during the long hours of the party is just one of them. Everyone will have a good time together when you have some party tents set up. 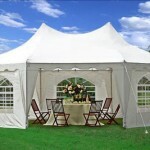 So, the next time you are having a party, consider party tents and all that they can do for you. And then contact us and let us get you set up. 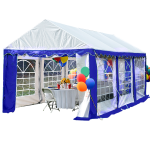 Your party will go well when you have party tents ready to use. This entry was posted in party tents and tagged party tents on January 14, 2016 by Canopies Tarps. Ready to throw a party for this fall season? Still hesitating a little because you’re not too keen on cleaning up the inevitable mess from the party? Don’t let cleaning fears keep you from hosting a fun autumn party. 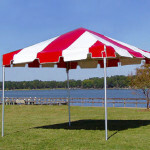 Instead, rely on party tents to help keep the mess outside of your home. It’s a joy to have kids attend the party. After all, the little ones can be super cute and sweet. However, what isn’t so cute is when they accidentally ruin furniture or break collectable items while in your home. Still, that’s not enough of a reason to ban them from the party when you can easily prevent the problem of them potentially breaking things by hosting the party outside in a tent. Both kids and adults are prone to spilling food and drinks. Furthermore, the more crowded a party is, the more likely it is for a spill to occur. And as you probably already know, a spill can easily turn into a nasty stain that’s greatly difficult to get rid of. So it’s really in your best interest to have the party take place in a setting where spills won’t become a great ordeal to contend with. What that means is you won’t want any nice carpet or indoor furniture around to soak up the spills. All in all, the best way to deal with this issue is to simply have the party in an outdoor setting. So contact us today to get a party tent for your next event. This entry was posted in party tents and tagged party tents on November 9, 2015 by CanopiesAnd Tarps.